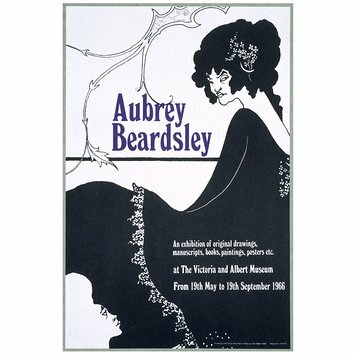 Poster advertising an exhibition of works by Aubrey Beardsley held at the Victoria & Albert Museum, 19 May – 19 September 1966; Image of a woman looking over her left shoulder, wearing a black gown. A profile of a face in the bottom left hand corner. Black and white, with text of 'Aubrey Beardsley' in purple; Colour offset lithograph. 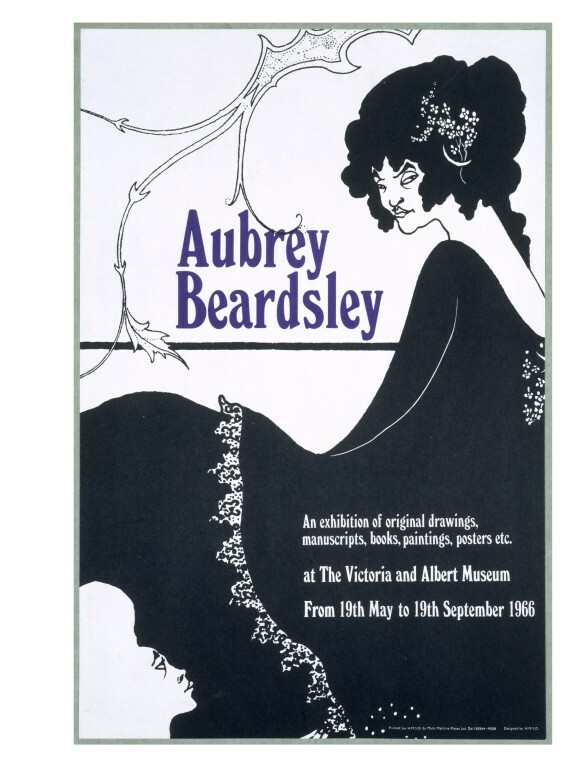 Aubrey Beardsley / An exhibition original drawings, manuscripts, books, paintings, posters etc. / at The Victoria and Albert Museum / From 19th May to 19th September 1966. Printed for H.M.S.O. by Multi Machine Plates Ltd. Dd. 158364-9508 Designed by H.M.S.O. Small test at bottom right hand corner of poster. Issued by Her Majesty's Stationery Office. Note: The design reproduced on this poster is part of the design for the book-plate of John Lumsden Propert from Vol I. of 'The Yellow Book'. The original Indian ink drawing was lent to the exhibition (no. 397) by Mr R A Harari. 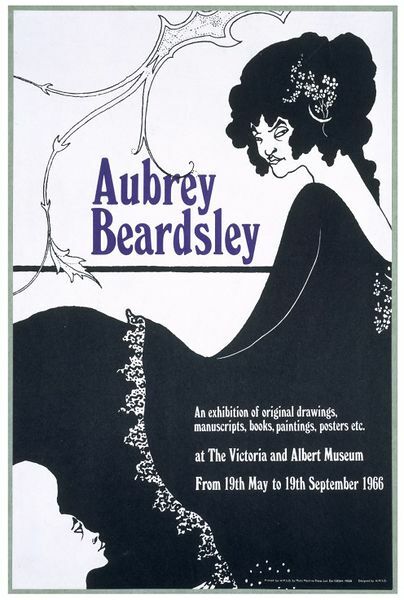 Poster advertising an exhibition of works by Aubrey Beardsley held at the Victoria & Albert Museum, 19 May – 19 September 1966; Showing a woman looking over her left shoulder, wearing a black gown; Black and white, with text of 'Aubrey Beardsley' in purple; Colour offset lithograph; Artwork after Aubrey Vincent Beardsley; Design by H. M. Stationery Office; London; 1966.